Label paper with rear gumming is excellent for marking packaged cultural artefacts. Used on envelopes, folders, boxes, sleeves etc., they allow the user to quickly and clearly identify what the packaging contains. In contrast to many other products on the market, label paper by KLUG-CONSERVATION meets all the requirements of long-term labelling. 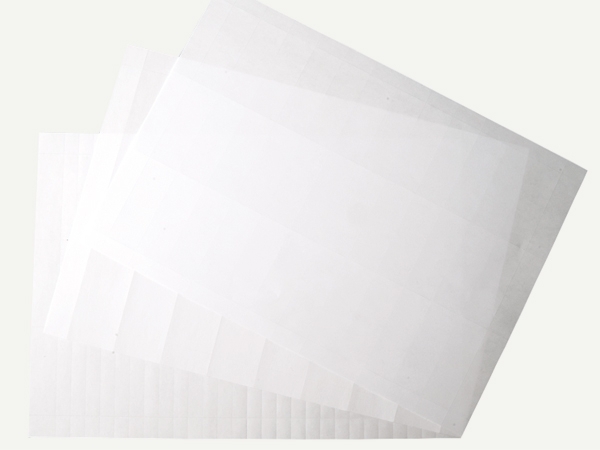 White coloured, conservation quality label paper with a dextrin-based gumming. Labels are available in A4 size (one A4 sheet) as well as many other sizes (micro-perforated A4 sheets). Suitable for printing using laser, inkjet, needle, thermo-transfer printers as well as for offset print.